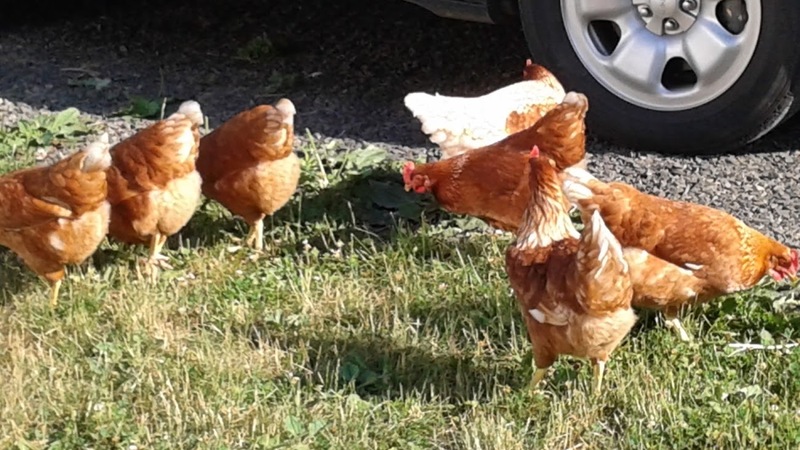 After a 28 year absence, fowl once again roam the grounds of my homestead. Chickens again rule the roost, although not physically, for now they prefer to sleep in the nest boxes or the small doorway to their run. Late last fall I made up my mind that eradicating the local tick and earwig population and enjoying fresh eggs with rich orange yolks (not pale yellow) would be my goal. Now I can't say for sure but since the seven girls began free-range foraging approximately 10 days after they arrived on May 10th, not one tick has found it's way onto my tick-sensitive body and the earwigs aren't as prevalent either. 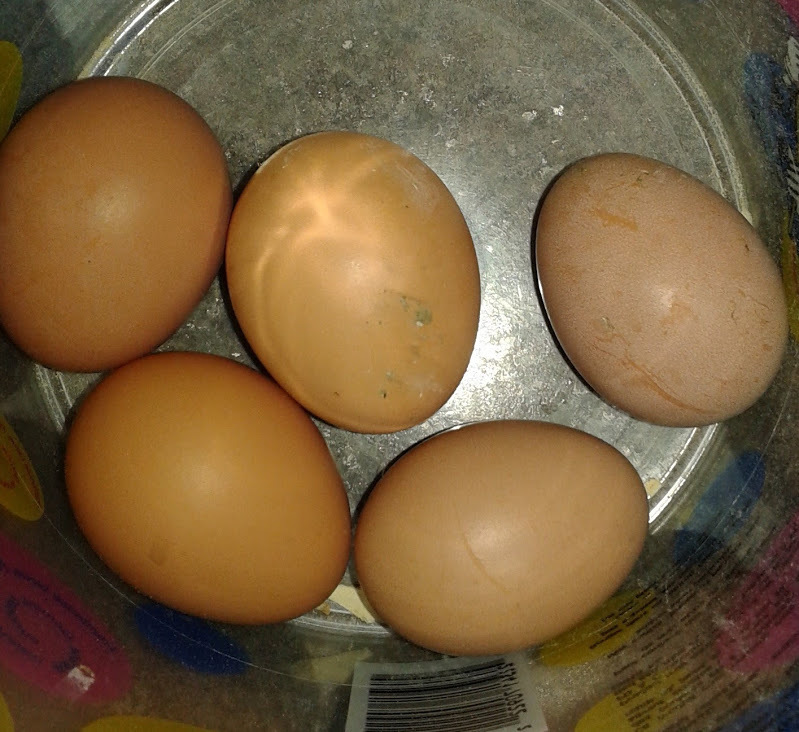 And then there are the 6-7, gorgeous brown eggs ranging from a light tan to a dark brown, that magically make an appearance daily. The first egg! Nobody claimed it. 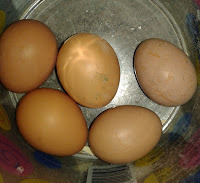 I mention the number of eggs because there are seven ladies and most days only six eggs. So I figured somebody was slacking off until I did some research at the library. I thought I knew all there was to know about chickens. I mean, ever since I can remember, a flock of approximately 15 hens and the odd rooster occupied the old chicken coop, now long gone. So I figured I was an expert. NOT! Now I do know that hens don't need a rooster to lay eggs. He is basically a spiffed up lord and protector. He settles squabbles, (and the girls do squabble a lot, hence the terms, 'pecking order' and 'hen fight'), and he seeks payment for his services lustfully and often! What I didn't know was when the young pullets (find that term in this book) would start to lay, how often they will lay an egg, the nutrition they need, the extra calcium they may require for shell formation, how to store eggs and how long eggs will keep under different conditions. Did you know that, when the egg exits the hen's vent (look it up) it is covered with an antibacterial secretion called the bloom? The bloom is a natural protectant to keep the egg from deteriorating and unwashed eggs can be stored for several weeks in a cool un-refrigerated environment for several weeks. Washed factory eggs (bloom removed) with the pale yellow yolks have probably been sitting around for a couple of months before they even make it to the store cooler. Fresh huh?? First stroll out of the compound. Now, depending on the type of hen, they will start laying at between 20 weeks or up to 6 months old, give or take week. Some are prolific layers, up to 300 plus eggs per year at peak production and some are laying 150 or so. It basically depends on the breed, whether purebred or a hybrid and also the age. Production declines as a hen ages, and size and colour of breed depends on a bird's parentage. 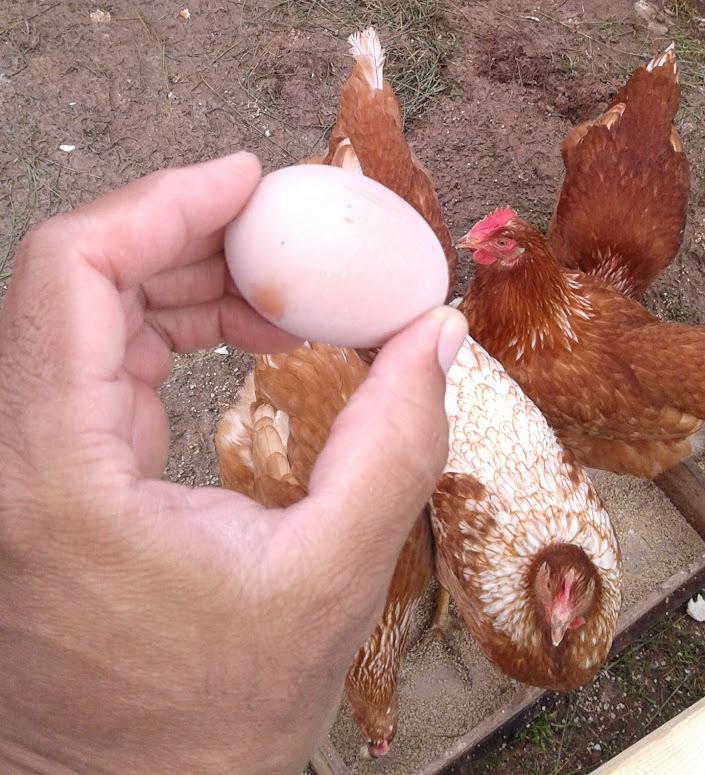 Certain breeds will lay white eggs, others shades of brown, from an off white to a dark mocha brown, some speckled and others green or blue, some large , some small. And guess what - a white egg tastes the same as a brown egg or a blue!! You don't eat the shell. When you get past egg differences, looking at hundreds of different breeds and sizes with different colouring and feathering and wattles is a whole new ballgame. Now the coop. No wait! I'll save that for part 2. Because deciding on a coop was a whole different stress level!! Have you ever attended a free program at your local library and were so excited by how awesome and fun it was for you or your kids? Did you wish that more people had attended and joined in the fun? Or maybe you were the one who found out late about an author reading or reptile visit that took place at your local library. You can help to spread the word by becoming a Community Ambassador and sharing our programs and special events through social media and this blog. Below we show you how easy it is to share with your friends and family. You can share local library events directly to Facebook and Twitter from our Calendar of Events. Just open up the specific program page, and click on the icons at the bottom. It’s a great way to share what is happening in your library. And it is easy! Just click on the method you wish to use to share with your friends and family. The most popular ones are Twitter and Facebook. That’s it! Happy sharing! 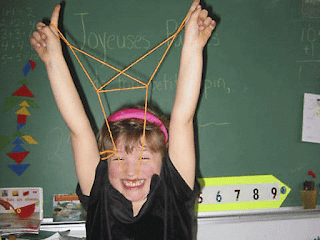 Remember Cat’s Cradle? Anne Glover sure does. 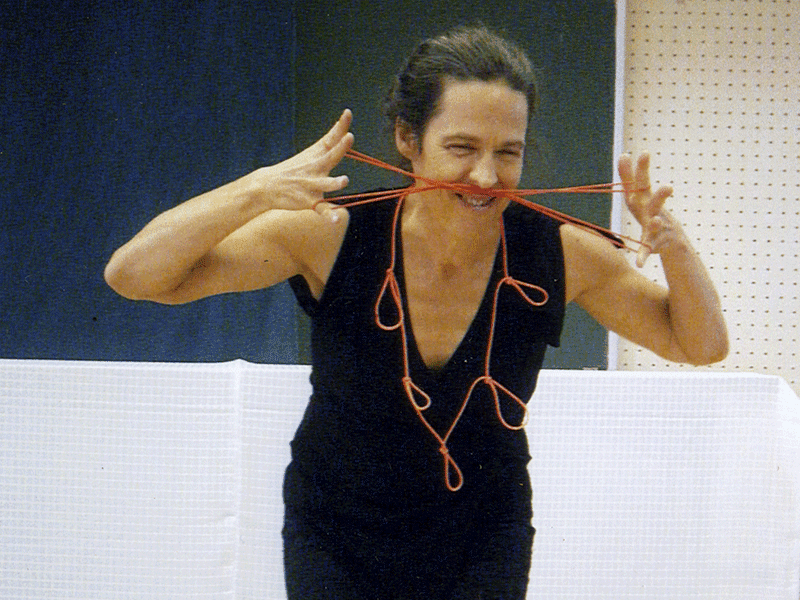 She makes strings come alive – with her special blend of stories and strings, you’ll never look at a shoelace the same way again. 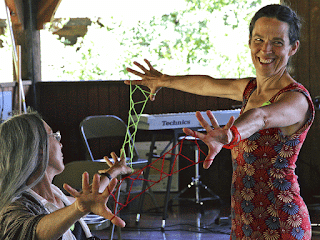 Professional storyteller Anne Glover, from Vancouver Island, will tour the province during July and August, performing at 29 public libraries, from Digby to Windsor and all the way to Sydney. Her show is best for ages 4 and up. We are lucky to have Anne visit Nova Scotia. She’s been all over the world, but this is her first trip to our beautiful province and we can’t wait for you to meet her at six of our libraries. 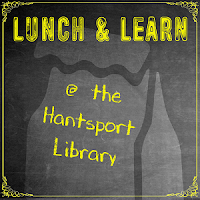 She will be in Hantsport on Monday, July 18 at 11 AM, in Kentville, Kingston, and Bridgetown on July 19, and in Middleton and Wolfville on July 20. Click on each town to find the exact time and location. Storytelling as an art form is both entertaining and acts as an educational tool. Historically, cultures have always told tales as a way of passing down beliefs, history and traditions. Storytelling stimulates children's imaginations and develops an appreciation of stories and reading. Anne's special style of storytelling will have your kids laughing and playing -- and you, too! The tour is organized by the Council of Youth Services, which includes youth services staff from all nine public library regions in Nova Scotia, with funding provided by the Nova Scotia Provincial Library, the Department of Communities Culture and Heritage and the Nova Scotia Library Association. In Bridgetown we are partnering with the RCMP's Senior Safety program to bring Anne Glover to children and their grown-ups, so kids, find a grandparent who wants to enjoy stories and bring them to the Legion Hall on Tuesday, July 19. In Kingston, the village is co-sponsoring the program, and in Middleton, the Friends of the Library are co-sponsoring the event on Wednesday July 20. Thanks to all our sponsors and partners for helping to make this great program happen. Find out more about Anne Glover on her website, and make your plans to see her when she is here in the Valley. I Can’t Believe it! The Isabel & Roy Jodrey Memorial Library is One Year Old! It was on June 27th 2015 that Hantsport’s new library opened its doors to the public. A lot has happened since then; some of it is as exciting as new shoots sprouting from the ground, some of it a little bit uncomfortable as growing pains often are. As our yearly statistics indicate many new people have come in to enjoy the new facility and to participate in a wide variety of programs. With the bigger space, we have been able to host visits from some crowd catching celebrities like Princess Hantsport, Santa Claus, and Scott Brison. The change in location from the school has allowed us to have open hours on Wednesday mornings which has developed into a popular time for families and caregivers of preschoolers to visit. In January, the renovations to the lower level were completed and as new furniture trickled in we were able to move the very popular Cozy Corner Storytime downstairs giving the children room to move about, listen to stories and create works of art. “Library Lab” is another program that has grown within the year and benefitted from the new program rooms. This is a group of chatty 10-14 year olds who come together every other Tuesday to explore craft techniques, art materials and science activities. They have had so much fun that many of them congregate here on non-program days. Another lively creative group is the Wednesday afternoon crafters who get together to chat as they stitch, hook, knit or weave. The program room on the lower level enabled this group to change their meeting time to a time when the library is open, every Wednesday from 1-3pm. Anyone is welcome, just bring along your project! Having a kitchen downstairs is an asset and has allowed us to introduce a new program called “Lunch & Learn”. This started in March and happens once per month when a speaker presents as participants munch on their lunch and sip their coffee or tea. Stay tuned for the Fall 2016 speaker line-up! Other programs held throughout the year were tech help tutorials and kids tech programs, senior’s week programs, a family literacy day event, winter carnival story walk & scavenger hunt, a March Break camp, Canada Reads event, and a monthly book club. If any of these pique your interest or you have an idea for something new, let us know and we will try to accommodate. We are now getting ready for year two! It is looking good so far. May I suggest you Renew Your Curiosity and check out our Summer 2016 programs found on the calendar of events. And for heaven’s sake, if you haven’t already been into the Isabel and Roy Jodrey Memorial Library, please come see us!